thebahamasweekly.com - Bimini is home to bust of Dr Martin Luther King Jr.
Bimini is home to bust of Dr Martin Luther King Jr.
Nassau, The Bahamas - Prime Minister the Rt. Hon. Perry Christie unveiled a bust in honour of the late United States Civil Rights leader Dr Martin Luther King Jr. during a ceremony in Alice Town, Bimini on Saturday, October 6, 2012. The Island, touted, as “The Gateway to The Bahamas” was the place where the Nobel Peace Prize winner wrote his acceptance speech in 1964, his sanitation workers speech and his eulogy in 1968. He was subsequently assassinated in 1968 in Memphis, Tennessee, USA. 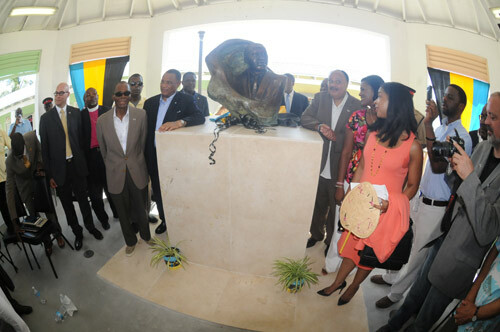 The bust, a bronze figure in the likeness of Dr. King, is mounted in the Bimini Craft Centre. It was designed and sculpted by noted sculptor Erik Blome. 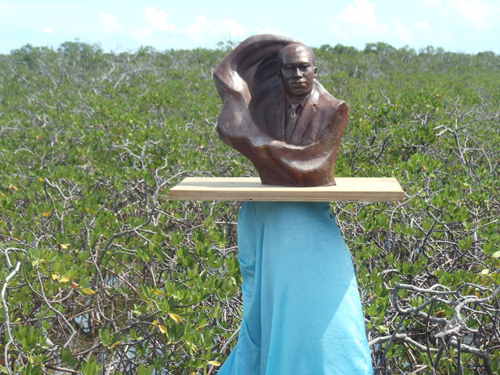 Another bust was erected in the mangroves where Dr King spent peaceful moments with famous Bimini boat maker and bone fisherman Captain Ansil Saunders. Present for the historic occasion were: Minister of Foreign Affairs and Immigration the Hon. Fred Mitchell, Minister of Tourism the Hon. Obie Wilchcombe, senior government officials, representatives of the United States Embassy in Nassau, Martin Luther King III and his wife Arndrea; Joyce Danford, Chair MLK Plaque Project, students of the Edward Waters College, residents, guests and sponsors. The Prime Minister said he was delighted to observe with the wonderful people of Bimini the historic occasion, which also coincided with the 48th anniversary of the visit of Dr King to that island. “This event marks the establishment of an international memorial in Bimini honouring the transforming work and great legacy of Nobel Peace Prize Laureate, Dr Martin Luther King Jr. His extreme sacrifice, brilliant life, his vision of non-violent change while impacting the United States of America and the international community, inspired the founding fathers of the Commonwealth of The Bahamas, led by our first Prime Minister the Rt. Hon. Sir Lynden Pindling in this nation’s struggle for self-determination and independence,” the Prime Minister said. He said a friendship formed between both men, who followed their convictions and dreams and changed the social, political and economic landscapes of both countries, which are inextricably bound together in an enduring friendship, common ideals, aspirations and shared purpose. “The rich history which is shared in Bimini has been influenced by native sons like Ansil Saunders, renowned bone-fisherman, boat builder, freedom fighter and articulate orator,” the Prime Minister said. He said the tremendous history of Bimini has a remarkable international flavour, replete with names of international figures who were attracted to the island’s bounties of nature, its restorative power, tranquility, distinct culture and charming people. These features brought Ponce de Leon to Bimini in search of the Fountain of Youth and inspired writer Ernest Hemingway who wrote his famous novel “Island in the Stream" there. The island was also a sanctuary for famous US congressman and pastor of the Abyssinian Baptist Church in New York the Rev’d Adam Clayton Powell. “Today, five centuries after Ponce de Leon came in discovery of the Fountain of Youth, tens of thousands of annual visitors from near and afar, as well as Bahamians are flocking to Bimini for enjoyment, restoration and a taste of its unique culture, offered by a friendly, proud people” the Prime Minister said. Also launched was the scholarship award programme for deserving Bahamian students to attend the historic Edward Waters College in Jacksonville, Florida, amongst other activities. 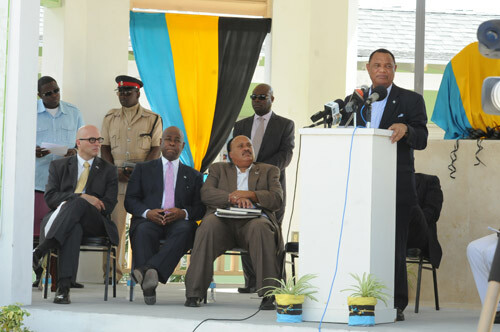 The Prime Minister said he hopes residents of Bimini benefit from the scholarship programme.